We had an apple farm close to where we lived when I was a kid. I loved visiting Aaamodt's Apple Farm in the fall. They had this great tasting room, with barrels of different varieties of apples that we could taste. That room had the best smell! And fresh apples make the very best applesauce. I made this dessert for my Sunday night dinner last week and it was a hit! They had wonderful flavor from the applesauce, crispy texture from the fried wonton topped with the decadence of caramel sauce. Perfect! Bring apple mixture to a boil, then let simmer until the liquids are almost gone and the apples are soft. Lay a wonton wrapper on a dry surface. Put a spoonful of the apple mixure on one half of the wonton wrapper. Dip your finger into water and wet the edges of the wonton wrapper - this will help it seal. Fold the wonton wrap over to make a triangle. Gently press the area around the applesauce mixture to remove the air bubbles. Repeat with the remaining wrappers and applesauce mixture. Heat oil and butter in a frying pan over medium heat. Fry the wontons (in batches) on each side until they are golden brown. Sprinkle with sugar just after they are removed from the pan. Drizzle with caramel sauce and serve warm. These were delicious, beautiful and deceptively easy. Definitely a recipe to keep! 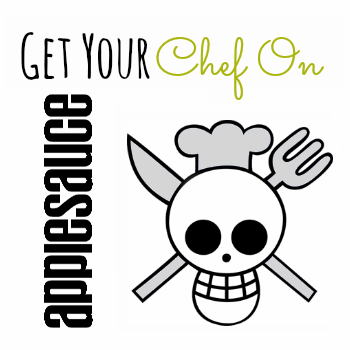 Head over the GYCO to see what other applesauce temptations my fellow bloggers have created. Soups to Satisfy Your Soul... and Your Stomach!